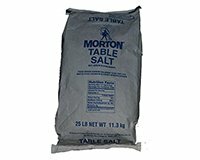 Bulk 25 Pound bag of Morton® Table Salt. Food Grade Sodium Chloride CAS # 7647-14-5. Meets Food Chemicals Codex Specifications.